Eating better can help to improve you health and also save your household money whether you’re cooking for one or a family. Some hints for the kitchen which will help you improve the nutritional quality of your food preparation. In our world of processed food, fibre is lacking in the diets of many people. Fibre is important in elimination of waste products and maintaining bowel health. It aids in regularity and helps to control constipation. Because of its bulk it will assist in appetite control. This contains explanations of less common food products or ones known by different names around the world. It will help you to know where to obtain them and how to incorporate them in cooking. What do you do when you're half way through cooking a recipe and you find you don't have the exact ingredient you need? Have a look at our ingredients subsitutions section to get ideas of what can be substituted for what. How to cut down fat during cooking by using low fat substitutes. 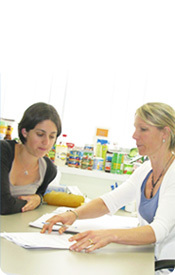 General & nutritional information about food products which are available from your supermarket.